Electrodes of two types have been fabricated for a use in an experimental microbiological fuel cell (MFC). One series consists of a piece of steel mesh covered with a coating of electrodeposited cobalt (II) hydroxide. 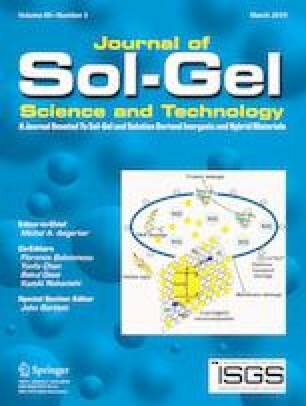 The other one includes a silicon oxide under-layer obtained with a sol–gel synthesis. Composition, morphology, and electrochemical behavior of the materials have been examined using X-ray photoelectron spectroscopy, scanning electron microscopy, and cyclic voltammetry, respectively. Oxidation state of +2 has been assigned to cobalt species in the as-deposited material. Dynamic cycling of potentials of modified electrodes has resulted in the increase of the cobalt oxidation state in the tested material. Formulas of the cobalt compounds have been proposed. The optimization of electrolyte composition (1 M CH3COOK/0.004 M KOH) has allowed to reduce the pH of the solution and extend the voltage window by 100 mV in the positive range of potentials. 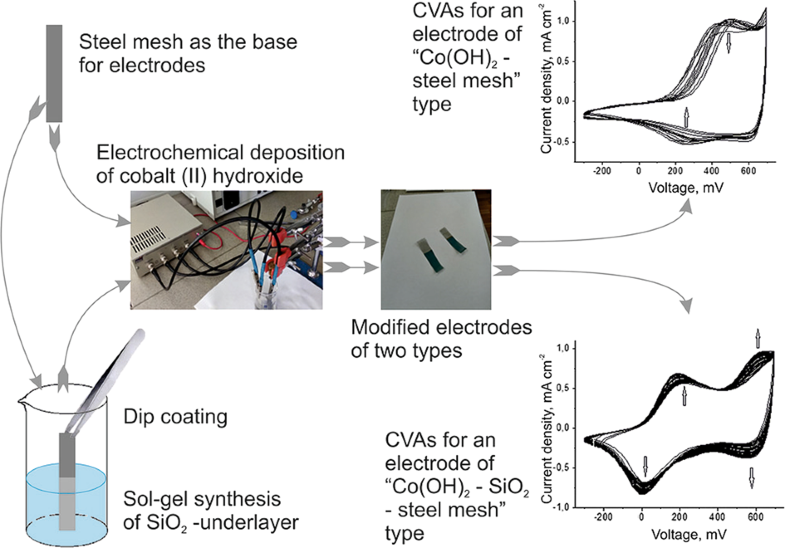 Cyclic voltammetric experiments have revealed a better cyclability for silica pre-modified electrodes than for electrodes without the under-layer. Microbiological tests have shown compatibility of the obtained electrode materials with bacteria Geobacter sulfurreducens. Two pieces of steel mesh are taken. One of them is used for electrodeposition of cobalt hydroxide without any previous processing. The other one is pre-coated with a layer of silicon oxide before the electrodeposition of cobalt hydroxide. Then cyclic voltammograms of both modified electrodes are compared to show a better electrochemical performance for the electrode with the silica layer. Silica under-layer improves electrochemical performance of the material based on cobalt (II) hydroxide. The use of an optimized electrolyte composition diminishes pH of solution and extends the voltage range. The electrodes modified with Co(OH)2 are more preferential for Geobacter sulfurreducens than bare steel mesh. The authors are grateful to the Russian Foundation for Basic Research (RFBR) for the financial support (grant 17-03-01201 А) and to the Resource Center “Physical methods of Surface Investigation” of Research Park of St. Petersburg State University for X-ray photoelectron spectroscopic research.